Our rich, Spritz butter cookies are made from scratch when you place your order. Handcrafted from my Irish grandmother's recipe, these cookies are sure to melt in your mouth. Each cookie is hand-dipped in a generous layer of semisweet chocolate. We use only the finest ingredients and make all our products by hand in small batches. 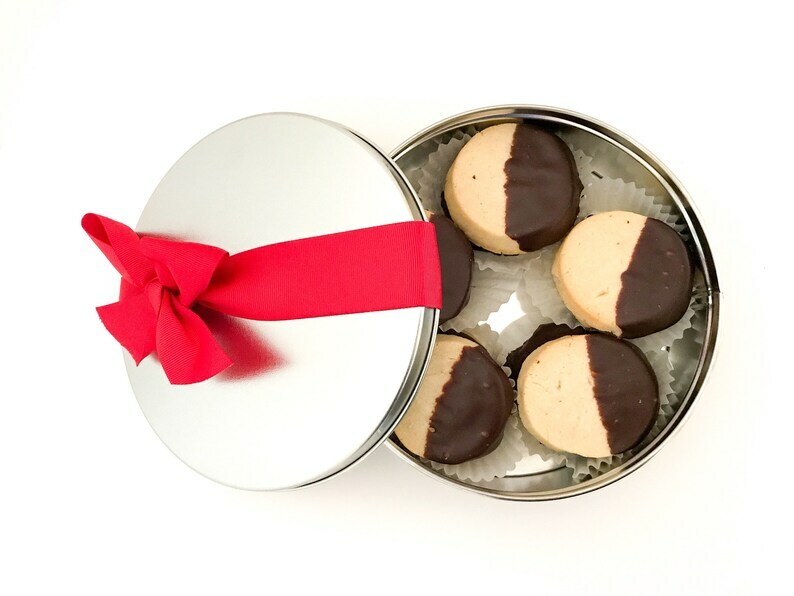 Our cookies come carefully packaged in a decorative tin. Perfect for holiday gifts, care packages for soldiers and students, sympathy and corporate gifts, a tasty thank you, or any occasion! Approx. 15 Spritz cookies with chocolate (about 12 oz) in 7 3/16" diameter cookie tin. Cookies are approx. 2 1/2". Gift messages available! If this is a gift, we would be happy to include your special message to the recipient. Just leave us a note when you place your order. Be sure to include the recipient's shipping address. If you would like to purchase this for local pickup (Cullman and Hanceville, AL only), please enter code PICKUP at checkout. Pickup is at the Cullman Farmer's Market or as arranged. Delivery is available for certain business locations. Due to the perishable nature of our products, we cannot accept returns, exchanges or cancellations. But if you have a problem with your order, please contact us. Customer satisfaction is our priority. We package our products carefully to ensure they reach your home safely. We cannot be responsible for damages caused by the shipping carrier. Dear Apple Mill Bakery, These cookies were sent to friends who are so good to me and so to being able to send them such sweetness meant alot to me. They were so surprised and enjoyed them so much! I ordered these as a gift for my aunt who is hard to get something for as she's always "downsizing". I was thrilled to hear from her how much she enjoyed them and being able to share them with her company! Thanks so much for providing such a wonderful product! Dear Apple Mill Bakery, These cookies were sent to friends who love to entertain. They were perfect because one person in the household has a nut allergy. Thanks so much for helping me send my gratitude! This arrived super quickly and should make a great Valentine gift for my husband. Thank you.